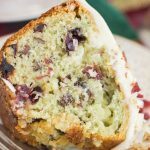 My Grandma’s moist, tender pistachio bread recipe in muffin form, and with extra cinnamon streusel! 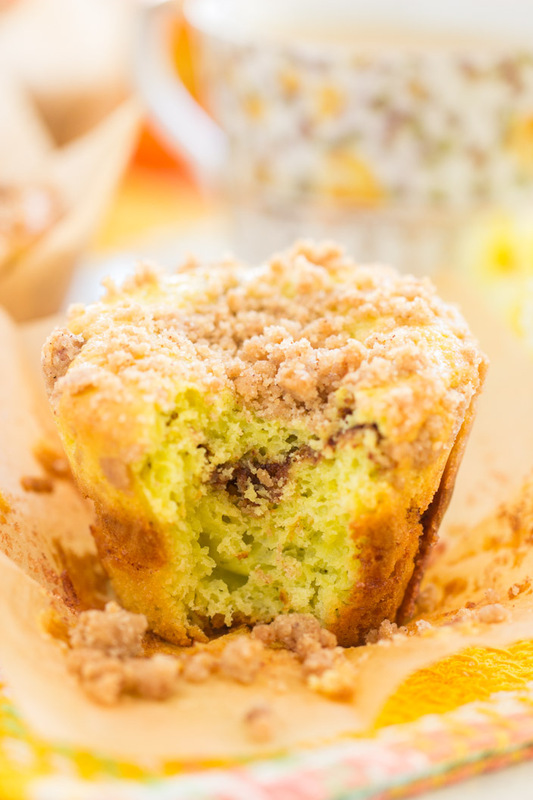 These Pistachio Bread Cinnamon Streusel Muffins are super moist and sweet, strong on pistachio, and feature a ribbon of cinnamon-sugar through the center, with a heap of buttery cinnamon crumb streusel on top! 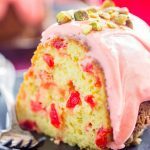 I’ve used my Grandma’s Pistachio Bread recipe to create a host of different cake mix bread recipes, as well as a whole bunch of easy bundt cake recipes. Her recipe produces such a nice, moist, sweet bread, almost like a coffee cake. And with a few tweaks, it’s also great for making cake mix bundt cakes! 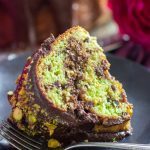 Grandma’s Pistachio Bread is a really popular recipe around here, and many of the derivatives are too. 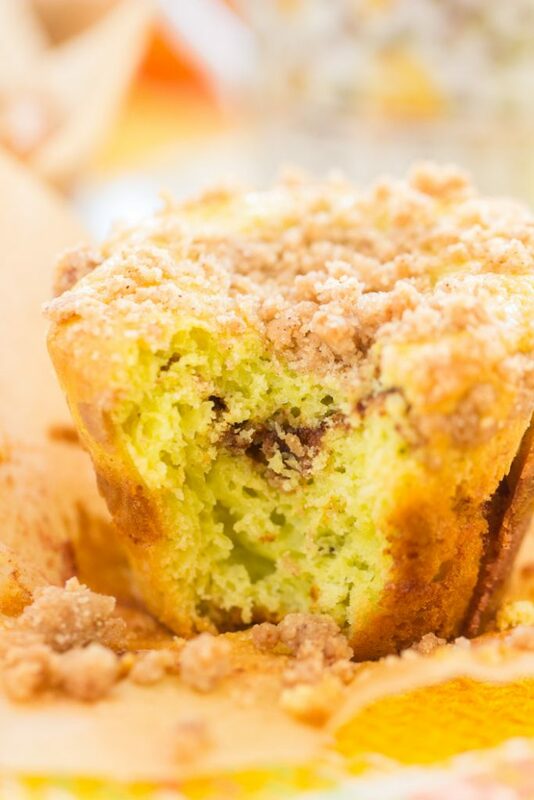 It only just dawned on me recently that there would be a ton of fun ways to adapt her recipe, including these Pistachio Bread Cinnamon Streusel Muffins. I wondered if it would work to make her famous Pistachio Bread recipe into Pistachio Bread muffins!! Omg, these Pistachio Bread Cinnamon Streusel Muffins are GREAT. Why is this a big deal? I guess it’s not, but guys, don’t you love a good muffin for breakfast on-the-run? And isn’t it invigorating to reinvent some of your favorites foods into a different format? Muffin vs. bread, well that’s different enough for me to get excited anyway. 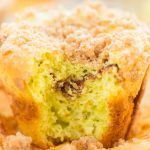 Besides, these Pistachio Bread Cinnamon Streusel Muffins are the same moist, flavorful pistachio bread recipe that you know and love, but there’s even more cinnamon to go around, and a ton of crumb topping here too. In addition to a thick ribbon of cinnamon-sugar through the center of each muffin, there’s a heap of streusel on top of each muffin too. 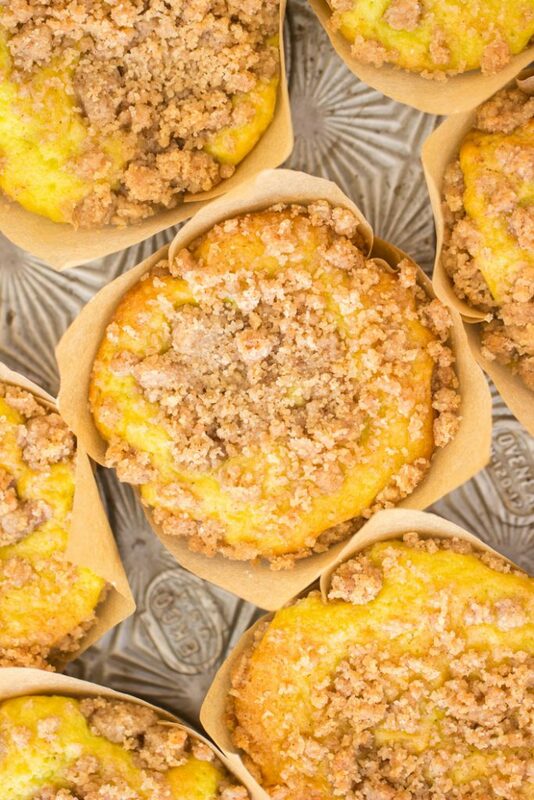 Sweet, buttery, slightly crunchy, wonderful cinnamon streusel! So I did it, and these Pistachio Bread Cinnamon Streusel Muffins were such a big success. I sent some with my S.O. to take to work, and he knew before he took them in that they were going to be a hit. He predicted that they would be a homerun, and they were. According to him, these Pistachio Bread Cinnamon Streusel Muffins disappeared fast. Like, faster than normal, even at an office workplace where most people are vultures around food! We try to make my Grandma’s Pistachio Bread for most family get-togethers and holidays, but I feel like it’s most fitting for Easter and springtime. Something about pistachios and springtime. 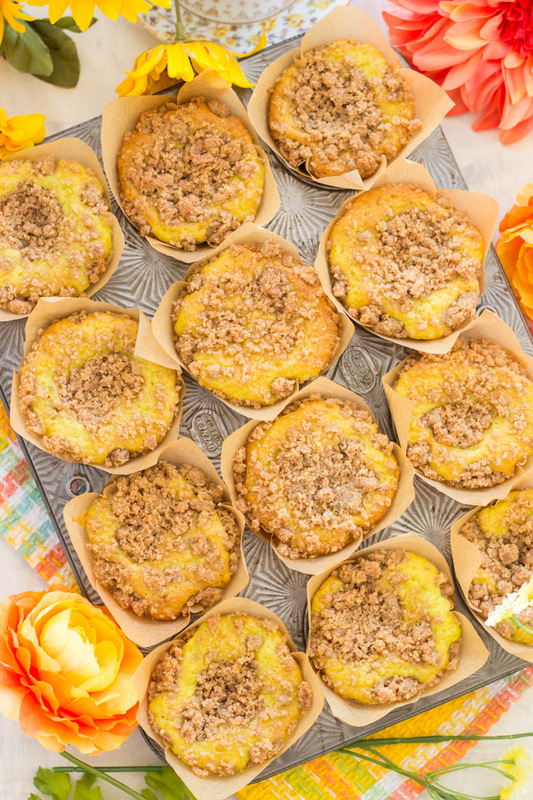 If you haven’t finalized your Easter menu, I feel like these Pistachio Bread Cinnamon Streusel Muffins would be a fabulous addition to Easter brunch! 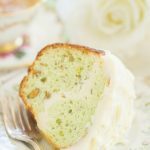 For other awesome pistachio treats, check out this Amaretto Pistachio Cheesecake, this Coconut Pistachio Bundt Cake, or these Pistachio Sugar Cookie Bars with Cream Cheese Frosting! 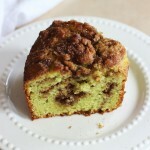 My Grandma's moist, tender pistachio bread recipe in muffin form, and with extra cinnamon streusel! 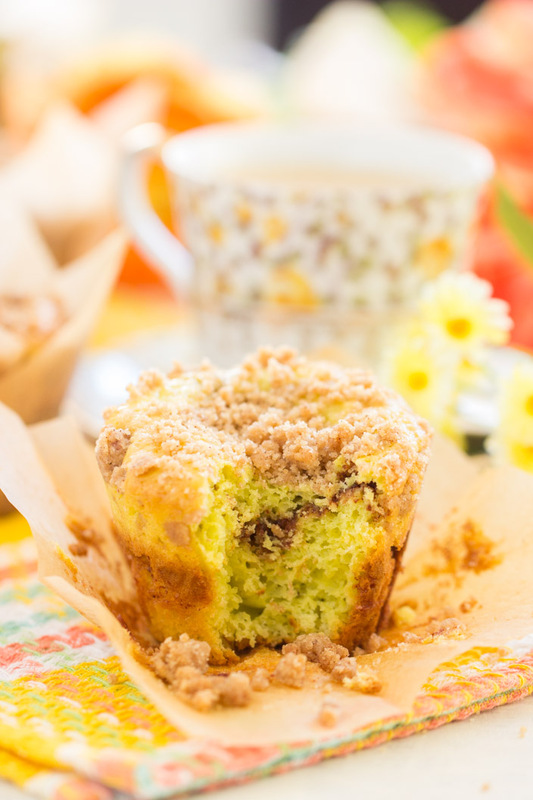 These Pistachio Bread Cinnamon Streusel Muffins are super moist and sweet, strong on pistachio, and feature a ribbon of cinnamon-sugar through the center, with a heap of buttery cinnamon crumb streusel on top! In a large bowl, stir together cake mix, pudding mix, sour cream, eggs, and oil. Batter will be very thick. In a small bowl, whisk together granulated sugar and cinnamon. Line 12 regular-sized muffin cups with paper liners. Using a spoon or cookie scoop, fill muffin cups 1/3-full with batter. Use a knife to spread out the batter so that it covers the bottom of the muffin cup, or rap the muffin pan on the counter a few times to spread the batter. Sprinkle with about 1 tsp. cinnamon-sugar mixture. Using a spoon or cookie scoop, cover the cinnamon-sugar mixture with batter, filling the muffin cup 2/3-full. In a small bowl, whisk together brown sugar, flour, and cinnamon. Add melted butter, and stir until mixture resembles coarse crumbles. If mixture is too wet, add an additional tablespoon or two of flour so that streusel is not overly wet. 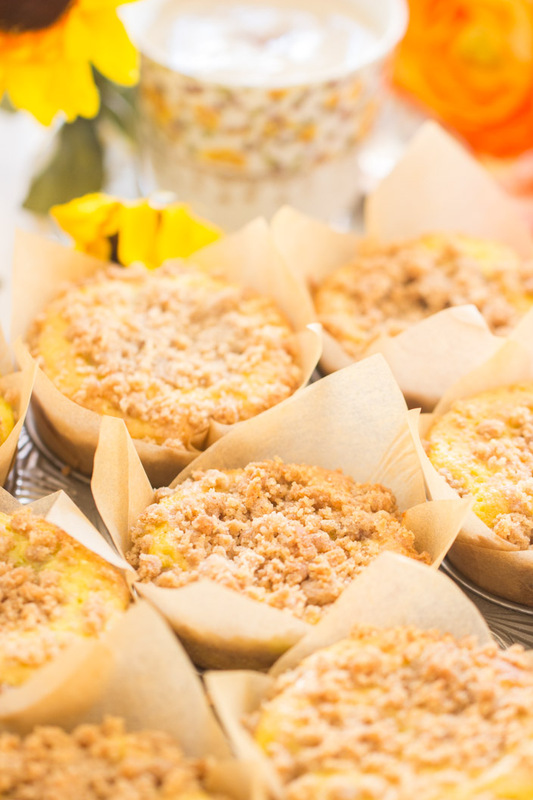 Sprinkle muffins with about 1 tablespoonful streusel. Bake at 350 degrees for 25-30 minutes, or until edges are golden, and a toothpick inserted near the center of a muffin comes out clean.